Xbox One owners are complaining that a new TV advert is switching their consoles on without their permission. 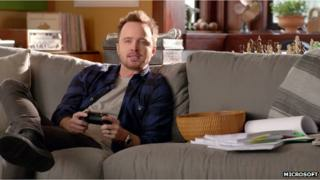 The ad - featuring Breaking Bad's Aaron Paul - has the actor say "Xbox On" near its start. The instruction appears to trigger the machine's Kinect voice/motion sensor, activating the console. A spokesman for the firm said it had no comment at this time, but noted that previous ads had also featured voice commands. Many people have posted comments about the problem on social media sites. "Aaron Paul just turned my Xbox One via the Xbox advert. (Which triggered the IR [infrared] blaster to switch my TV off..)" tweeted Qassim Farid, a UK-based tech blogger. Chesterfield-based Tom Neal wrote: "@Xbox your new TV advert is annoying the hell outta me. Aaron Paul keeps turning my console on… #stooooop"
The post reflects the attitude of many console owners who have posted about the matter who appear more bemused than angered by the glitch. This is not the first time such an effect has been reported. In November Xbox One owner Tim Kimberl posted a video to YouTube showing that an internet ad that featured the command "Xbox go to Dead Rising 3" launched the game on his system. Users affected by the issue do have the ability to turn off the Kinect sensor, which prevents the console responding to voice commands. The issue has parallels with an effect played for laughs in the TV series 30 Rock where a voice-controlled television went haywire when on-screen characters mentioned its trigger words. The problem has arisen in the same week that Microsoft began selling a cheaper version of the Xbox One without the Kinect. It said it made the move - timed to coincide with the E3 video games expo - following feedback from gamers who did not want to pay extra for the accessory. The decision allows the machine to retail at the same price as Sony's PlayStation 4. Microsoft's press event at the Los Angeles show was notable for hardly featuring the Kinect. Only a dancing game, a Disney motion-controlled music rhythm title, and an indie game called Fru - which allows players to control a character by making body shapes - appeared to take advantage of the feature. However, Microsoft did announce outside the show that a software update would soon allow developers access to more graphics power when the Kinect was not in use. This may help address complaints that several cross-platform games offer higher resolutions and frame rates on the PS4 than their Xbox equivalents. However, the new ad signals that the US firm intends to keep promoting the Kinect as a feature that distinguishes its machine from its Japanese rival's, even if the price quoted at its end is for the standalone machine.